Were it not for the STL dishes and huge tower out back, this small building on Concord Road in Brentwood, Tennessee could almost be mistaken for a private home. 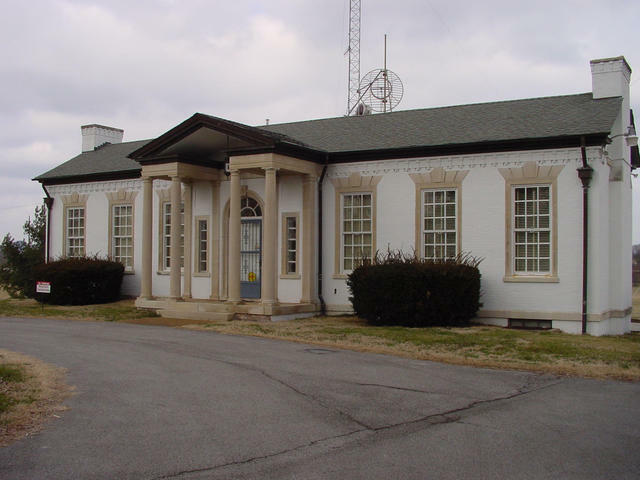 CE Watt Hairston's office is on the right, a small kitchen is across the foyer at left, and the transmitter room occupies the entire back half of the building. Although you cannot see it from this side, there is actually a basement; when the original 50-kW transmitter was installed, its power-supply system filled most of the basement. There's also a civil-defense studio and a toilet down there.